The objective of the International Brotherhood of Electrical Workers has always been the same since our founding in 1891: To organize all workers in the entire electrical industry, including all those in public utilities and electrical manufacturing, into local unions, to promote reasonable methods of work, to cultivate feelings of friendship among those of our industry, to settle all disputes between employers and employees by arbitration (if possible), to assist each other in sickness or distress, to secure employment, to reduce the hours of daily labor, to secure adequate pay for our work, to seek a higher and higher standard of living, to seek security for the individual, and by legal and proper means to elevate the moral, intellectual and social conditions of our members, their families and dependents, in the interest of a higher standard of citizenship. Quite a mouthful, but for those of us who are already members, it's time to speak up and let the pride of being an IBEW member shine through. Help those that don't recognize the benefits of working under an agreement by explaining it to them. Many individuals have been intimidated by the very person that they work and make money for, to the point that unionism sounds like a very bad idea. Most non-union workers don't even have the benefit of health insurance anymore. If they do, most have the premium deducted from their weekly paycheck. The number one goal for workers should be to acquire a better standard of living for themselves and their families. Make no mistake, organizing into a Union with Collective Bargaining rights will ensure you have a voice in your workplace and your future. Better pay, health insurance for you and your family, and a pension enabling us to retire with dignity, are goals we all strive to attain. If you would like to learn more about the advantages of working for a signatory contractor and the benefits of working with a contract through IBEW Local 573, please contact Michael Nemkovich. Union guys are laid off all the time! Well unfortunately layoffs are a possibility in the construction industry. But this issue has been used as a scare tactic with great success by non-union employers to intimidate workers about the IBEW. The truth is that IBEW electricians are laid off no more often than any other workers in our industry. We use a referral process to refer our electricians to our signatory contractors. Our electricians do not rely only on one contractor; they have the option of working for dozens of different contractors working on many different types of projects. Our members work for various contractors for various lengths of time. These jobs may last weeks sometimes years depending on the type of project. If a journeyman becomes unemployed due to lack of work or he quits a contractor to seek another type of job with another contractor he signs our “out of work” list. When our contractors need manpower, they call IBEW Local 573, and we refer our electricians in order from the “out of work” list. They start with a new contractor at the SAME hourly rate and benefit package!! Being an IBEW electrician, you no longer only rely on one contractor; you have the option of working for literally dozens of contractors in the area at the same wages and benefits with each one. IBEW Local unions have geographical “jurisdiction” for which they are responsible. IBEW Local 573’s “jurisdiction” is Trumbull County and parts of Ashtabula, Geauga, Mahoning and Portage counties in Ohio’s Mahoning Valley. If we hit a slowdown in this area, you as an IBEW member have the opportunity to go to work in other IBEW Local unions that need manpower. When you do you receive the wage and benefit package applicable in that Local Union. IBEW referral systems refer Local members first, then “travelers”. A traveler is a member from ANY other local union. Travelling is not a common occurrence but if work is slow locally you can seek work in other local unions who are busy. Again, the advantage of being an IBEW member is you have access to hundreds of contractors for work. If the company you are working for slows, you now have options and don’t have to start at the bottom again with a new contractor. In the past this was a true statement for many. We only offered two options. Take and pass the journeyman test or start the apprenticeship from the beginning. This is NO LONGER TRUE. As of 2006, the International Brotherhood of Electrical Workers have established additional classifications: Construction Wireman & Construction Electrician. We look at an individual’s work experience and administer an assessment test to determine his abilities and where he may need additional training. We then classify an individual as a Construction Wireman 1-4 or Construction Electrician 1-3. The starting hourly rate varies from 40% to 80% of Journeyman rate, depending on experience. The CW or CE then takes the task-specific training that he needs and each year gets a an increase in pay based on the Journeyman rate and ultimately becomes a journeyman wireman upon passing the Journeyman Wireman test. This program provides an avenue for electricians, whose skills and experience may not be at journeyman level by our standards, to become an IBEW member, reap the benefits, earn a great hourly rate, and get annual increases as he completes individualized training and progresses to become a journeyman wireman. For our contractors, these classifications provide competitive composite crew rates for them to be competitive in the commercial market. If an individual has the experience and knowledge, he will be classified immediately as a journeyman wireman. Nothing could be farther from the truth. Our signatory contractors are our partners. We work very closely every day with our contractors to make them as successful and profitable as possible. The more successful they are the better wages and benefits we can negotiate. It’s a true partnership. We negotiate a fair, competitive agreement that sets out the rules for both parties fairly. We can only negotiate good wages and benefits if we are productive, efficient, and professional and if we make the contractor money…period. A local union needs funds to operate just like any other organization. We fund our local by paying union dues. These funds are established by the membership at a union meeting by majority vote. We ALL pay these dues and obviously want to keep them as low as possible. IBEW Local 573 is a democratic organization, and each member has a voice and a vote. Everything done is approved by the body. IBEW Local 573 has always been and will continue to be fiscally responsible. Do you contribute towards your health coverage out of your paycheck? Does your employer deduct money out of your check for a 401K? Do you have an annuity? Do you have to work 40 hours before you receive overtime pay? Are you supplying your own power tools, ladders, cordless tools? What do they cost? Our members happily pay the small amount in dues, which are tax deductible, to receive the pay and benefits they do and to have a voice in their working lives. Organizing a union in your workplace does seem intimidating and can seem like such an impossible uphill battle. It does take courage, but is very worth it; thousands of workers do just that each year. Fact is its illegal for an employer to threaten, intimidate, or coerce workers who are exercising their right to unionize. However, many employers will illegally do just that. That’s where the experience the IBEW has in organizing is useful. 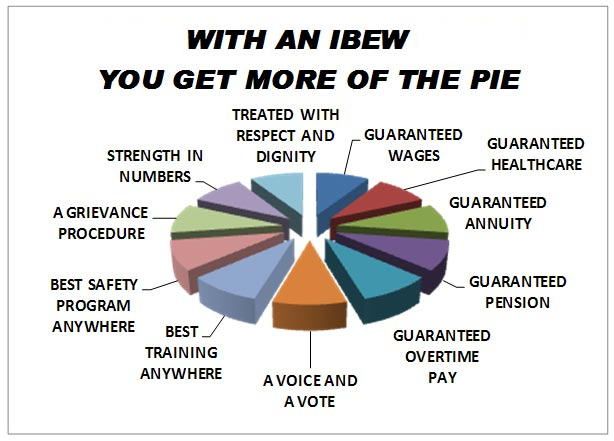 In the event that an employer violates the law, the full resources of the IBEW will be brought to bear on them. IBEW Local 573 will support workers who want union representation; we will ensure that no matter what happens during an organizing drive that workers will be brought into the IBEW and put to work. There are many more “misconceptions” out there. Do yourself a favor and find out the FACTS for yourself!